The following is an extract of text from Low & Rebelo (1996) for Forests. The forests mapped in Mucina & Rutherford have a limited extent compared to those mapped by Low & Rebelo. Forests are restricted to frost-free areas with mean annual rainfall of more than 525mm in the winter rainfall region and more than 725 mm rainfall in the summer rainfall region. They occur from sea level to over 2100m above sea level. Forests rarely burn, mainly due to the high humidity - under extremely hot and dry (berg wind) conditions fires may occur and destroy the forest structure. 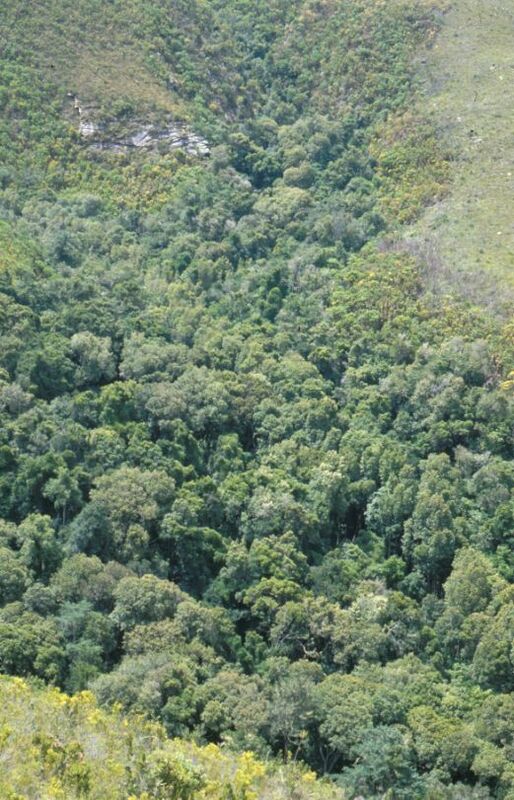 Forests tend to occur in patches, few of which cover areas greater than 1 km 2, with areas greater than this only common along the Garden Route and Lowveld Escarpment. Even added together, forests cover less than 0.25% of southern Africa's surface area, making this the smallest biome on the subcontinent. The canopy cover of forests is continuous, comprising mostly evergreen trees, and beneath it the vegetation is multi-layered. Herbaceous plants, particularly ferns, are only common in the montane forests, whereas lianas and epiphytes are common throughout. The ground layer is almost absent due to the dense shade. On the edges of the patches are distinctive communities, the so-called fringe and ecotonal communities, which are able to tolerate fire. Some 649 woody and 636 herbaceous plant species are recorded from forests. However, forests are not floristically uniform. Three separate forest types are recognized in this account. Specialized forests that occur in small areas and very sporadically - such as mangrove, swamp and fringe forests are not separated from these three types. Partly because of their rarity, their grandeur and their setting, forests are an important tourist attraction in South Africa. They have been exploited in the past for valuable timber, including Black Stinkwood Ocotea bullata and Outeniqua Yellowwood Podocarpus falcatus. Some forests were removed for the establishment of exotic plantations. A major plant invader of forests is Blackwood Acacia melanoxylon. Forest conservation has two facets: the maintenance of components and critical processes in the forests - which requires the conservation of the large mammals and birds which disperse seeds and maintain gap processes which allow succession within the forests - and the maintenance of gene flow - which requires allowing seed dispensers and poillinators to move along the corridors between forest patches. Thus the proclamation of isolated stands of forests as reserves may be insufficient for their conservation. Sustainable use of forests may require that their fauna be effectively conserved! Data for Swaziland were not available. 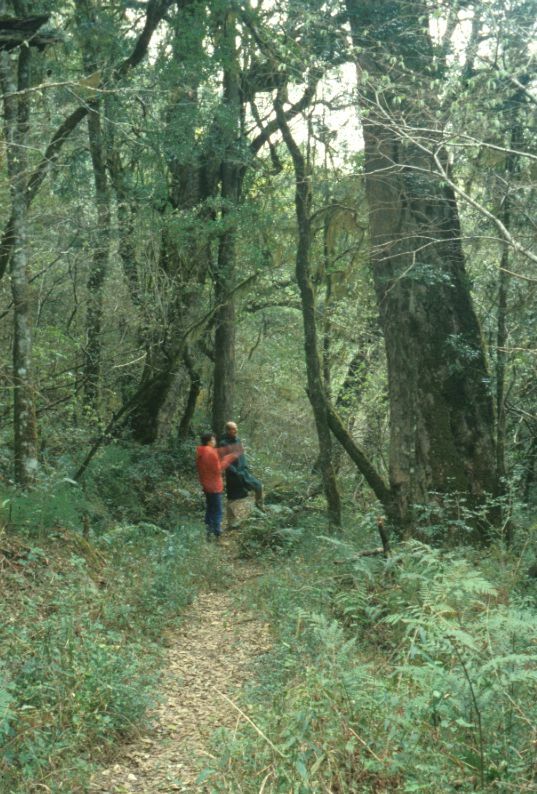 Understorey of afromontane forest near Hogsback, Eastern Cape. Kloof forest in Bosmansbos Wilderness Area, Langeberg, southern Cape. 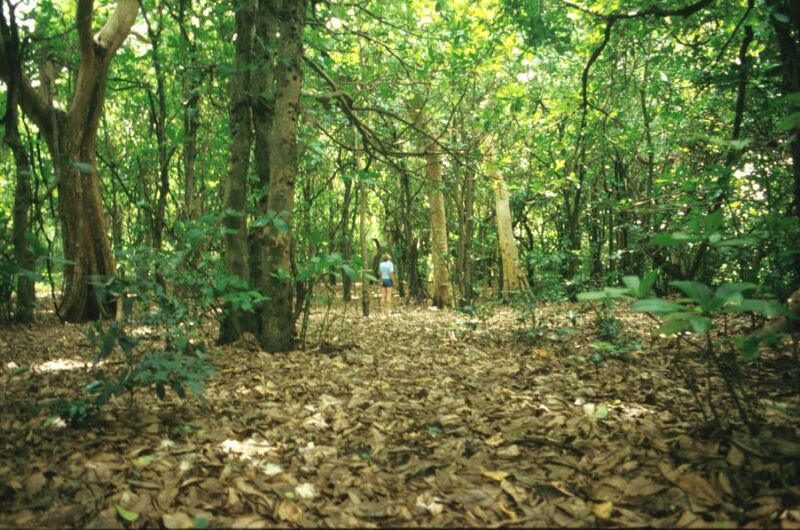 Understorey of a coastal forest in northern Zululand. 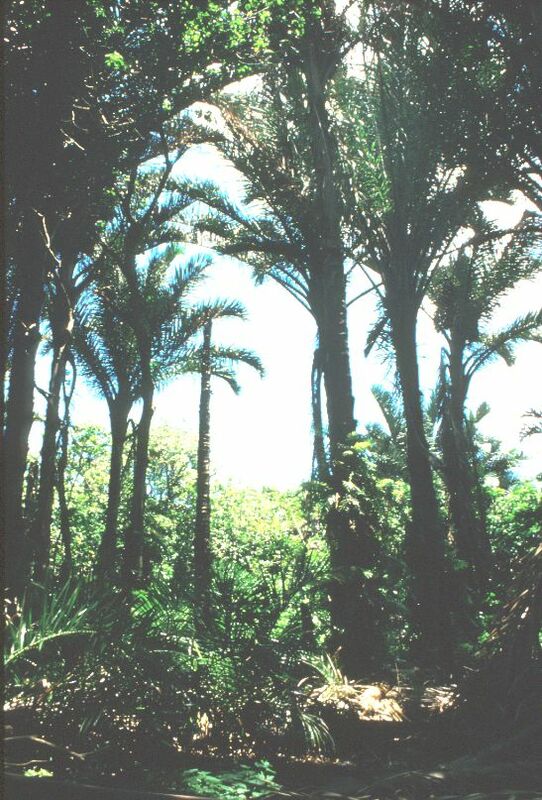 Palm forests in northern Zululand. 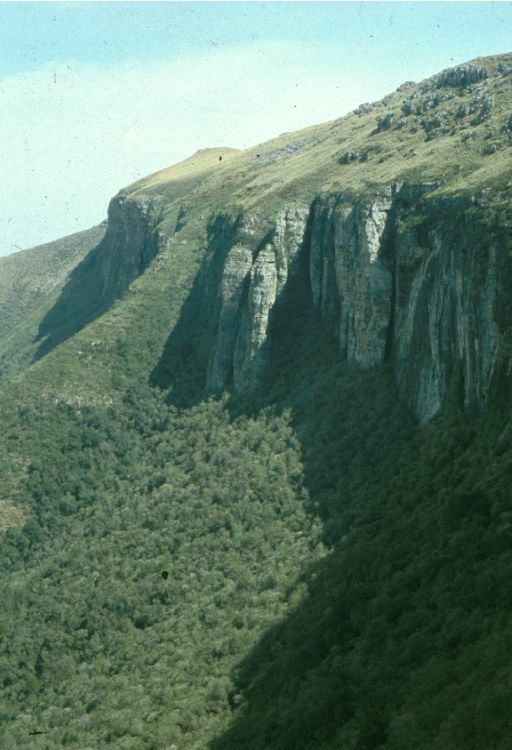 A typical inland gallery forest at the base of a cliff face, Bruintjieshoogte near Somerset East, Eastern Cape.